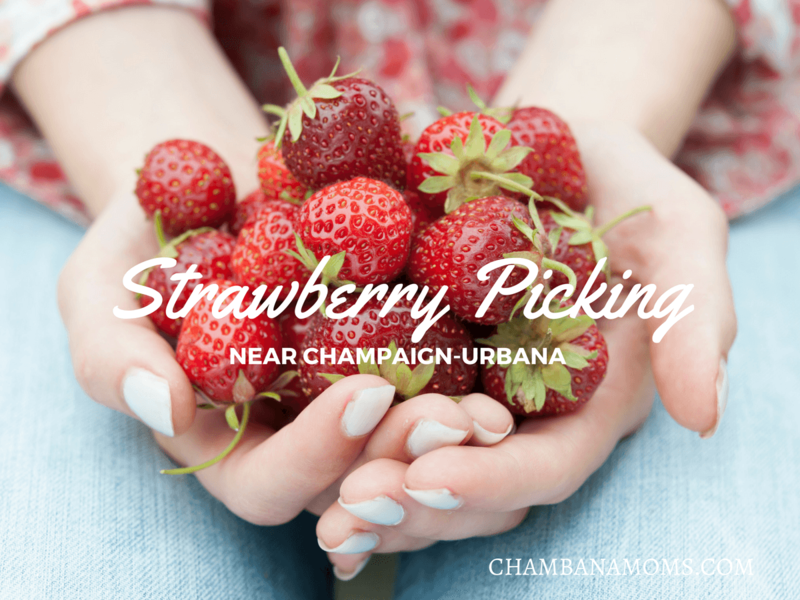 Early summer means strawberries, and Champaign-Urbana friends are in luck: we’ve dug up several places within roughly an hour’s drive from Champaign-Urbana to pick your own strawberries. The season is short, so if you blink you might miss it. To be sure that there are berries ripe for the picking, we recommend that you call ahead before you go to any farm (some also put up information on their Facebook pages and/or websites). 1) Be sure to bring plenty of sunscreen; sunglasses and hats are also helpful. Remember, there is no shade while berry picking. 2) Where there is fruit there is often bugs. Go early as possible; be prepared to do sunscreen and bug repellent. 3) We recommend that you bring cash to pay for berries. 5) Remember, berry season is short! Looking for other u-pick info? We’ve posted information on u-picks near Champaign-Urbana for blueberries, peaches, and apples. Location: About 45 minutes from Champaign-Urbana, depending on where you live. Easy drive up I-57, exit at Paxton, go north on Route 45. Here’s the map. Notes: Open Monday thru Sunday, 8 am – 8 pm until the first week of June or so. Prices for U Pick Strawberries are $2.99 per pound, with a 5-pound minimum per person over 12 years old. This locally owned family farm has the earliest of the area strawberry farm seasons. Notes: Closed on Sundays. Only takes cash. Posts regular updates on its Facebook page. Has other crops all season long, including pumpkins in the fall. The season at Braffet generally starts right before Memorial Day and lasts about four weeks. In 2018, berries probably not ready until early June, according their Facebook. Notes: Open 7 days a week during picking season. Only takes cash or checks. Posts regular updates on its Facebook page. Our family went to Jeffries Orchard in Springfield last summer, and you can read all about this no-frills experience on the website. Typically opens for u pick in mid-May, but like others this year, it seems the 2018 season may be later than usual due to cooler temperatures. They have a roadside stand and sell produce all summer long. Notes: Open 7 days a week. Takes credit cards. Posts regular updates on its Facebook page. Also has blueberry and peaches on site, but season is much later in the summer. For 2018, opening for picking expected around Memorial Day in the last week of May. Strawberry season usually lasts about a month. Location: About 75 minutes from southwest Champaign, straight south between Mattoon and Effingham. Notes: Open 7 days a week during picking season. Posts regular updates on its Facebook page. Also has blueberries and blackberries on site, but season is much later in the summer. Did we miss your favorite strawberry u pick?